Salford’s Liberal Democrats have chosen their candidate for the Pendlebury by-election, to be held in a month’s time. After the death of Labour Councillor Maureen Lea on 17th January, the Pendlebury ward now has a vacant seat. The by-election will be held on 19th March. 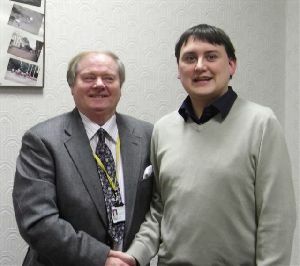 Paul Gregory being congratulated on his selection by the Leader of the Liberal Democrats Group, Councillor Norman Owen. The candidate’s name was announced last night (Thursday 12th February) as local man Paul Gregory, who is the head of Grosvenor Media – a web design company on Agecroft Road in Pendlebury. The picture shows Paul being congratulated on his selection by the Leader of the Liberal Democrats Group, Councillor Norman Owen, who currently holds the Claremont ward council seat. While the Lib Dems and BNP have announced their candidates for the Pendlebury by-election, the tories haven’t bothered (perhaps they are not too interested in Clifton/Pendlebury). Labour do have a candidate, but there’s little to no detail about him other than he’s a retiree and lives in Worsley.